Need A Holiday Guest House? We Rent Them! If you’re expecting family and friends to visit during the upcoming holidays, plan now for a little extra room to make their visit even more special. If you own an RV, don’t forget that it makes the perfect Guest House to sleep from two to six or more during the holidays. Though sharing your home with those you love is fun and builds great memories for life, the holidays can also bring added stress for everyone, and a ‘guest house’ where your visitors can have some private alone time will make everyone’s visit better than ever. If you don’t own an RV, Campbell RV can help out with an RV Rental. 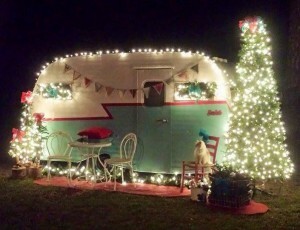 And it’s easy to create a comfortable and festive space for your visitors in your RV. Here are a few tips . . .
Place your RV in an area where your guests will have easy access as well as some privacy for alone time. If you have acreage or a large lot, consider staging the RV in an area easily accessible to your home but not too close to outdoor activities, such as family football, where a stray ball could hit the RV and disturb your guests. Create a welcoming front door with a door mat lined with poinsettias, potted mums, or maybe small Christmas trees. Bring the festivities indoors with small poinsettias, compact decorations, and holiday treats to greet your guests. A warm blanket, magazines, books, and videos will give your guests options for late nights or alone time. Don’t forget to add basics, and maybe a few surprises to the kitchen, such as bottled water, microwave popcorn and hot chocolate. These are just a few tips that will help you create a wonderful experience for your guests during the holidays. If you want more ideas, Contact Us and we’ll help. Merry Christmas and Happy Holidays from all of your friends at Campbell RV.